The most suitable office desk furniture for your workplace will be the one that makes you feel most comfortable and productive in. 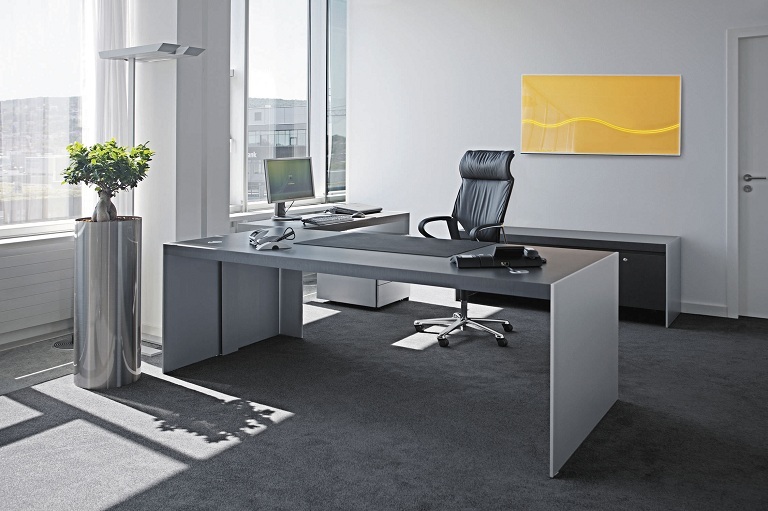 The right desk will make a difference in the way you see your job and your satisfaction from your work environment. Before you let yourself fall for a beautiful desk, it is important that you keep in mind the space you have available in your office, your budget and how frequent you will be using it. Here are a few steps for choosing the right office desk furniture that will help you create a comfortable work environment and be more efficient at work. One of the biggest mistakes people do when choosing their office desk furniture is overestimating how much room they really have. An empty office space may look huge until you put a desk and a chair in it. So make sure to measure your space. Take also into account the doorways and windows that you’ll need to get your furniture through. This step is important for the factor of comfort. If you will be using your desk only for a couple of hours a day to check email and get some paperwork done, a stylish desk may win over a comfortable one. On the other hand, if you will be spending 8+ hours in your office, comfort is imperative. Depending on your budget, you may decide to look for cheaper office desks, or invest in quality furniture. For inspiration as well as to get an idea of pricing, surf the Internet and look through office furniture magazines. In addition to the price of your desk, consider also the price of the chair and computer equipment you’ll need to buy. If you are on a low budget, consider buying online as online stores usually offer better deals as well as a larger variety of options for you to choose from. From ultra contemporary to antique desks, there is a range of furniture models for you to choose from. Just don’t forget the comfort factor when selecting an older desk. Antique furniture pieces can look fabulous, but they may not be able to offer you the level of comfort you need. And while modern desks may have the ergonomics that offers great comfort, they may look too futuristic for a traditional office space. Overall, you will need to consider your main priorities, comfort and aesthetics in order to select pieces that will fit both your taste and needs. In order to be comfortable an office desk furniture needs to accommodate your body size. So, if you are a tall person, make sure the table height will be proportioned according to your body size. Nevertheless, if you are a shorter person, a table that is too high and a chair that is non-adjustable, may have your feet dangling, which is not a good thing.